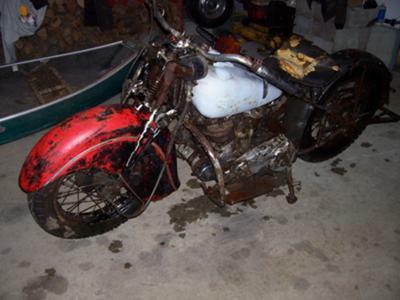 I believe that this is a picture of a barn fresh 1945 Indian Scout motorcycle. I am not completely, positively certain that's what it is but I have a title that indicates that it is indeed a 1945 Indian 45 Scout. It has a foot clutch, side shift girder, front end. The 18 wheels volt meter and speedometer are intact. 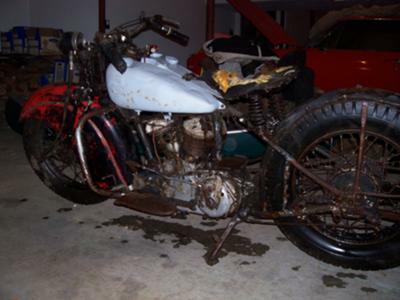 The antique Indian Scout has lots of original hard to find parts. The old Indian motorcycle is complete, the transmission works, it rolls free and the engine actually turns over just fine. and then you have a question about the old Indian you can leave me a message (my name is Robert) using the comments form below this ad (and don't forget to mention that you saw it on GoGoCycles Used Motorcycle Classifieds gogocycles.com). GoGoCycles would like to invite our visitors who are having problems with their own 1945 Indian Scout to leave a description of the problem that you are experiencing to see if somebody who stops by might offer a solution or share some advice on how to fix your motorcycle (and DON'T FORGET to leave your contact information in case they need to get in touch with you). If you are having trouble finding parts, you can post what it is that you are looking for that you need to repair your Indian motorcycle. AND it would also be helpful if you would write a review of the 1945 Indian to make others aware of any problems common to this bike or to list its positive features, make recommendations for desirable accessories or anything else you think we should know. We encourage you to submit your opinions on whether or not this is actually a 1945 Indian as the title Robert has in hand states and to write a review of the 1945 Indian Scout if you have had experience with it, not to kill the old Indian's reputation or to give it a bad review but to help potential buyers make informed decisions and to benefit the biker community as a whole. I believe that old Indian motorcycles like this one are currently selling for pretty good money. I think you can easily get $10,000 for these old bikes since they don't make them anymore! I wouldn't sell it out with just keep it! 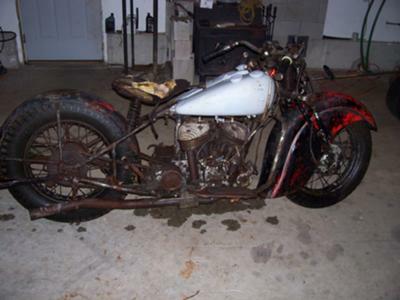 Front end, rear frame section, and engine appear to be an Indian Model 640B, 45 cubic inch, Military Scout if the engine case serial number begins 640 followed by rest of serial number. Suspect the title reads 1945 as the year in which it was either removed from "war essential" police work or the military and titled for the first time. If engine serial begins 741 then it's a 30 cubic inch 741B engine in a 640B frame. Join in and write your own page! It's easy to do. How? Simply click here to return to INDIAN SCOUT CLASSIFIED ADS.